The Value Add System adjusted for the Hottest Teams enters Sunday's game in the 97th percentile of 17.3 million brackets, and would be the best method presented if the prediction of Duke making the Final Four proves correct Sunday evening. The bracket could pick three of four Final Four teams if Duke AND Villanova win Sunday, as it already picked Michigan but was not one of the 0.03% of brackets (5,532 of 17,300,000) to pick Sister Jean's Loyola team. If Duke loses, then the Value Add System that gave toss-up games to the worse seed as a minor upset is currently in the 98th percentile, would be the top bracket method. Each system based on the Value Add Total of the players on the roster (adjustments for injuries and returning players) picked Villanova to win the title, so they would all drop several percentage points with a Villanova loss Sunday, but alternately shoot up among the elite brackets in the country if Nova won one or both in the Final Four. This bracket was in the 100th Percentage as the 72,000 best bracket of 17,300,000 until Texas Tech beat Purdue - a game the system would have predicted correctly based on Isaac Haas' injury if it happened before the bracket. 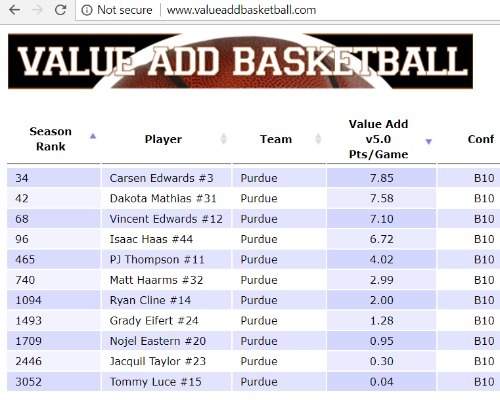 As you can see from the explanation before the tournament, the Value Add system rated Purdue three points better (+18.1 to +15.1) than Texas Tech when both were injury free at the start of the tournament. While all Value Add systems predict a Villanova win at 2 p.m. ET, the other two variations disagree on the Duke-Kansas game later Sunday. The system based on the better-experienced guards goes with Kansas and Value Add All-American Devonte Graham, while the system based on the Top 3 Value Add players agrees with the Hottest system above in picking Duke. These systems were all much more accurate than the alternative systems based on coaching experience and potential mismatches. All brackets were put in this "8th methods" bracket so anyone could go to ESPN to see how the Value Add system performed against the other 17.3 million brackets. In response to a request by a Senator at a speech for www.takeback.org yesterday, below give results of the Value Add basketball bracket that is in the 99th percentile with chances for wins in 12 of the remaining 15 games including a Villanova win over Kentucky in the national championship. First, I want to detail the incredibly close 5-way race for the Most Valuable Player in the country from the 4,068 on the newly updated www.valueaddbasketball.com site. Everyone else looks at offensive stats first, so let's first look at the defense. Carter's led a West Virginia defense with four defensive rebounds and five steals, as they help Marshall to only 86% of their normal offensive production (they normally score 1.10 points per possession, and only scored on 71 of 75 possessions for 0.95 points per possession - so 0.95 divided by 1.10 is 0.86. If Carter can perform anywhere near that level against Villanova - the top offense in the country with 1.20 points per trip - then his defensive rating would improve enough to help him move up into the top three. Bridges led and even more impressive defensive effort as Villanova held an Alabama team to only 58 points on 66 trips, which is only 0.81 of their normal offensive output of 1.09 per trip. Bridges did not have any steals, and with two blocked shots and defensive rebounds ranks just below Carter for the game's defensive effort, but we are talking an A+ vs an A.
Landale had a terrible NIT performance against Washington. Not only did Washington run all over the Saint Mary's defense that he anchors, scoring 81 points in 64 trips down the court, but Landale did not block a shot or grab a steal and only recorded one defensive rebound. Landale was solid on offense, with 7 of 12 shooting and five offensive rebounds to be worth 1.52 points per time he had the ball - however he did not have the ball that much and his 14 points performance was actually not as strong as Carter running the offense with the same 1.52 rating, or even Bridges 1.24 but handling the ball a lot more to dominate the second half against Alabama. Carter hit 5 of 7 three-pointers en route to 28 points, and Bridges scored only one first half point before taking over to finish with 5 of 8 three-pointers for 23 points. Once again an A+ for Carter and an A for Bridges, while Landale was very efficient but just not enough touches. Put it all together, and on both offense and defense, Carter and Bridges are surging heading into their showdown Friday, while Landale needs to get the ball more on offense and play tougher defense tonight to stay ahead of them in this 5-player race to determine who is the Most Valuable Player in the country. My Tuesday speech asking Senators to pass a resolution was pre-empted by a Senator shouting out, “Don’t tell me you had a basketball bracket in the 99th percentile after all these upsets!” Yes, here is the link to the www.valueaddbasketball.com bracket that is currently 150,000th out of 17.3 million and could still be correct in 12 of the final 15 games. “Take Upsets in tight” gave any toss-up games – within a point either way – to the worse seed to account for the “hunter” having an edge over the hunted in the toss-up games. We plugged each option into an “8 methods” group in the ESPN bracket challenge to provide an independent tracking of where these Value Add-based and competing methods stacked up against the other 17.3 million brackets submitted. The first column put your bracket in the 89th percentile – with 24 of 32 in the first round and 8 of 16 picks in the second round. However, the second column is above the 99th percentile with 24 of 32 in the first round but 10 of 16 in the second round for 440 points and another 1120 potential points left due to 12 more potential wins in 15 games culminating with a predicted 76-71 Villanova win over Kentucky in the championship. We provided these three Value Add-based brackets along with several other methods in a Breitbart piece, and then in the link to that story to adjust for late-breaking injuries before the tournament started, and then plugged the final picks into the ESPN group, where you can see the rankings after future games are completed. The two competing bracket methods that did not work were based on assuming more experience coaches can overcome a team with a little more Value Add (just below average at 44th percentile) and even worse seeing if a mismatch in one component of the game such as three-pointers, steals or offensive rebounds could lead to upsets (a pathetic 8th percentile). That mismatch also held the Composite down to the 66th percentile. Relying on the most NBA talent yielded a below average bracket (44th percentile), HOWEVER, it could improve dramatically if it’s prediction of Duke defeating Kentucky in the championship holds true. The other three adjustments to the bracket based on Value Add after injuries have been very strong, with a tweak for the Hottest teams currently in the 96th percentile, and tweaks for more experienced guards in the 93rd percentile, and finally going with the team with the three best Value Add players in the 89th percentile. The lesson once again is to rely heavily upon Value Add for your brackets – and while tweaks based on experienced guards or finishing the season strong are fine – adjusting for coaches or style of play will only hurt your bracket or worse yet your favorite conference generally costs you wins. Stick with Value Add. As for the Value Add bracket that is behind on 150,000 brackets, and ahead of 17.1 million brackets for the 99.1 percentile, here are the 12 wins still possible from the final 15 games.